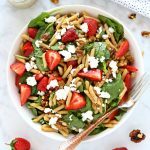 This Strawberry Spinach Pasta Salad with Poppy Seed Dressing is the perfect summer salad recipe featuring delicious pasta and in-season fruits and veggies! Add the vegetable oil, apple cider vinegar, lemon juice, honey, mustard, poppy seeds, and salt to a mason jar and shake to combine. Prepare the Barilla Penne Ready Pasta according to package directions (it only takes 60 seconds in the microwave!). Let cool on a plate or in a shallow bowl. Add the Barilla Penne Ready Pasta to a serving bowl and top with the strawberries, spinach, nuts, and crumbled goat cheese. Pour the dressing over top and toss well. Feel free to use regular Barilla Penne Pasta in place of Ready Pasta in this recipe. Simply cook according to package directions, rinse and cool before adding to the salad.